We have set up a new, easy way to allow everyone to help us raise funds, 24 hours a day, 7 days a week! You can now do your online shopping and support the PTA fund without any additional cost to you. All it needs is a couple of extra clicks and the PTA will earn commission on your shopping. When you click through to the Mandeville easyfundraising page, you select the retailer you want to shop at and the site will show you the commission the PTA earns from your shopping basket. We won't know who shopped or what you bought, but we will get a percentage of the costs into our fund. The prices are the same as if you bought "normally" - in fact, there are sometimes special offers that could even save you money! It's easy, so why not raise fund as you go? 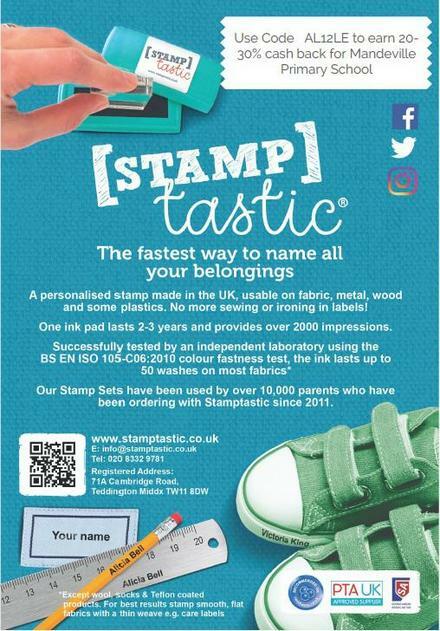 This product gives you an easy way to name all your children's belongings - and if you use the code "AL12LE" when checking out 30% will go to the Friends of Mandeville. Find this amazing offer by clicking here. If you have ideas for fundraising events, please get in touch with us - helpers and ideas are always welcome.